I'd like to accept this I Love Your Blog award from Kristine of WenchdGrafix Designs who has labeled me her Guilty Pleasure in the blog reading world. You can read what she had to say about me here (right down the bottom of her post). Kristine also combined another award - with the same set of rules - so, technically I received two awards. I've just chosen the one with the best graphic to display here. The rules for both these awards say that if you receive it you're supposed to link to the blog of the person who gave it to you (done that) and choose seven more recipients whose blogs you love... oh dear... not so much a guilty pleasure any more, just guilty. I have to admit I don't read a lot of personal/individual blogs regularly. At least not regularly enough to say 'I love your blog'. Of the blogs I do read, the majority are boring technology, business, art news and social networking news written by collaborations of people who like to think their opinion actually matters more than cracking a smile every once in a while (hey that rhymes). Pseudo journalists and straight faced niche experts who've all had humor lobotomies. So remember, back at the start I said, "I'd like to accept this I Love Your Blog award..." well... I'd like to but I've yet to find one guilty pleasure blog... how am I supposed to find seven? I know quite a few people visit my blog. If you're reading this then I guess you're one of them. Do you have a blog of your own? Do you think it's something I would enjoy? Will it keep me coming back day after day? Will I subscribe to your RSS Feed? In short, will I love your blog? Leave your blog link in the comments below and make a comment telling me why you think I'd like your blog. Here's a tip, I may be an artist but I'm not that fascinated by 'work in progress' art blogs. I'm a thinker and I like ideas. The more imaginative the better. No doubt I'm going to be underwhelmed with the response but, if you'd like me to mention your blog in a special post explaining why I think others will love your blog, not much will happen if you don't leave a comment. 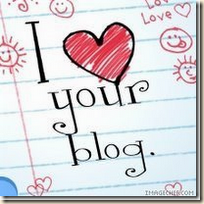 I want to love your blog... not in an icky way either... I promise I won't read in my underwear... stop thinking about me in my underwear... I'm not that kind of guilty pleasure! Hello. Well, I thought you might like my blog. Don't be put off by the name, I do more then crochet. I am an avid photography buff and comedy-seeker-outter. I put things on my blog that make me laugh or amaze me. So, take a gander. Hey Nicole, thanks for stopping by and leaving a comment. I did take a look at your blog and enjoyed some of your photos etc. Not enough words for me though. I like to hear about the behind the scenes stuff on photos etc. I'm the same with art. If I really like something I want to know more about it than just what I see.